I have been known on occasion to rant a little over fashion trends. And sometimes I’ve had to eat my words. Like the time in 2014 when I wrote that I would never, ever wear drawstring pants again. Then promptly fell in love with a pair, bought them, and had to admit that I should probably never say never. Same with jumpsuits, or boiler suits as everyone seems to be calling them now. Everyone except me. I still think of a “boiler suit” as a piece of apparel accessorized with a tool belt and a hard hat, but never mind that now. Even though socks have become undoubtedly cool these days, wearing visible socks breaks one of my long-held fashion rules. Socks are to be seen in running shoes when I’m running, or in hiking boots on the trails, period, because visible socks with jeans or dress pants are frumpy. Since I grew out of my Mary-Janes and ankle-sock look when I was twelve, I’ve worn socks in boots, or with shoes if the pant fell so as to make them invisible. Otherwise it was bare ankles with cropped pants, or maybe pantyhose or opaque tights in cooler weather. I was decidedly judgy about socks. I had a rule, and I stuck to it. Until recently. In socks and loafers and a matching chair. Until last week, in fact, when midwinter wardrobe fatigue sent me searching for inspiration, looking for some way to revive my passion for fashion that did not involve shopping. And maybe utilize some pieces that I haven’t worn enough this winter. I sat at my computer or on my exercise bike scrolling through Pinterest images, leafing through fashion magazines. And then while I was waiting for my computer to boot up the other morning, I looked up, and the answer to my problem was staring me in the face. 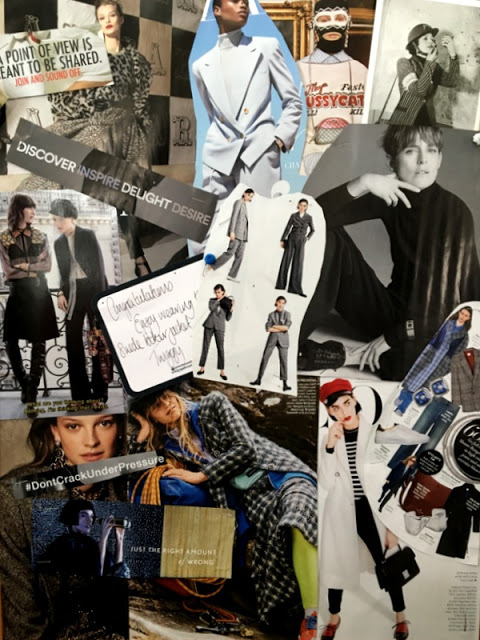 In the very middle of my inspiration board, which is supposed to give me inspiration but which I seem to have been ignoring, were four small images of women in suits. One of them looking very sassy in socks. Huh. Socks. My inspiration board had the answer all along. And when I started casting about on the net, I noticed that some of the very coolest “grown-up” women wear socks. Like Olivia Colman, below in an exquisite navy suit, with oxfords and socks. I saw this Vanity Fair shot of Olivia on Alyson Walsh’s blog That’s Not My Age. I can’t believe that I haven’t seen her in The Favourite yet. Or Lynn Slater, the Accidental Icon in socks and jeans and sneakers. Nobody can say she isn’t cool. 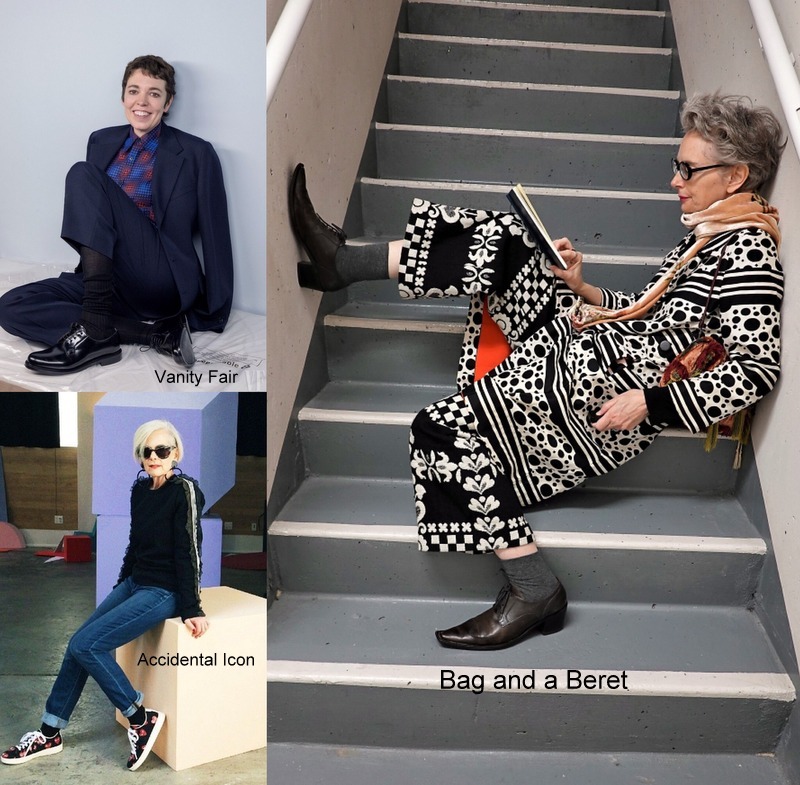 And Canada’s own style icon, Melanie Kobayashi from Bag and a Beret. Melanie is the coolest of the cool. And funny too. I love how those grey socks take the ornateness of her pants and coat down just a notch. Now, I don’t have the style savoir faire of these ladies, but I do have socks. Olivia Colman source, Lynn Slater source, and Melanie Kobayashi source. So. 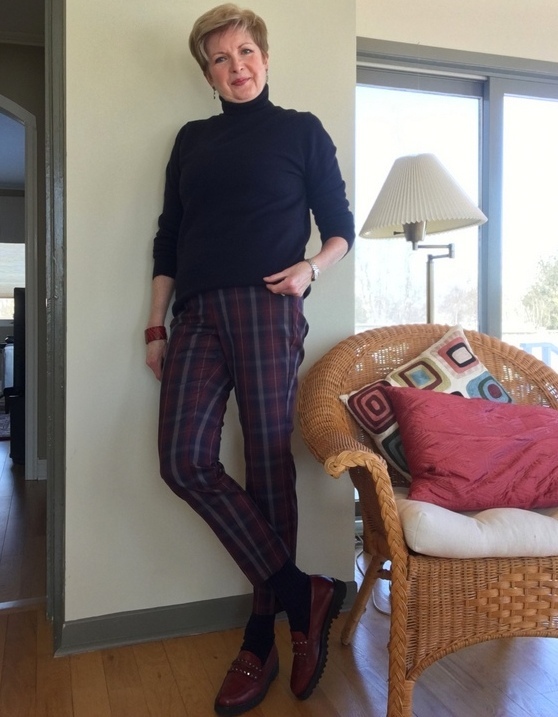 I dug out these navy socks and pulled them on with my Uniqlo navy cashmere turtleneck, my Rag and Bone plaid pants, and my Paul Green chunky loafers. 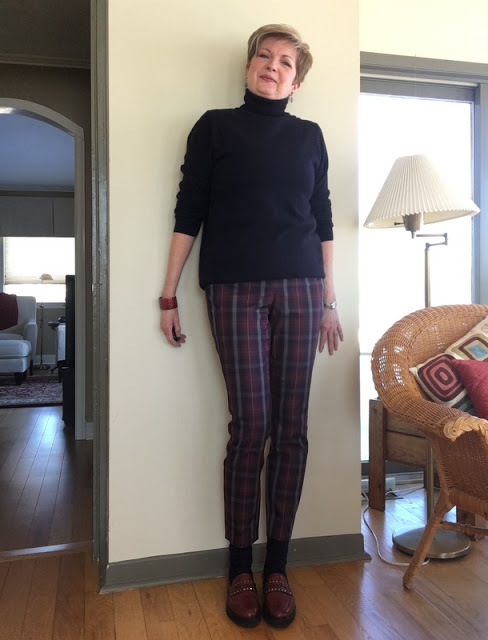 I actually bought the navy sweater as an option to wear with these plaid pants. But I’ve been so busy wearing it with my jeans and boots, I haven’t tried them together. This outfit makes me happy. And as long as I don’t have to wade snow, or slush puddles, I could wear this look right now. Happy in my socks and loafers. It’s worth noting, I think, that not all of the socks and shoes with cropped pants outfits I tried worked for me. I tried other socks; my navy striped socks with cropped jeans made me look a little like Ronald McDonald. Ha. I tried different shoes, ballet flats, for instance, and found that the look needs the chunkiness and thick soles of these loafers to look “right” to me. Just enough of a remix to satiate my appetite for change. So, yeah, socks, it seems, are something I can do… now. With the right pants, and the right shoes, and the right socks, of course, I’m evolving. Breaking, albeit a little tentatively, my own long-held fashion rule. How cool is that? I don’t think I’m ready for the socks with sandals trend just yet. Ha. If ever. That look still makes me chuckle, unless the socks are worn to be ironic, deliberately frumpy or slightly wrong-looking by someone who is a lot younger, and a lot quirkier, than me. In socks and sandals, I think I’d feel kind of like Geena Davis as Miriam in The Accidental Tourist. Remember Miriam? Flying frizzy hair, socks, high heels, and flapping vintage garments? She was gorgeous in that role. But that’s a role that’s way too quirky for this former farm-girl who spent too long in the classroom to truly be a rule-breaker. But the socks with pants thing, well, believe it or not, I’m coming around on that one. And trying this look that I said I’d never wear has allowed me to see some of the pieces in my closet in a new way. And solved my winter wardrobe fatigue problem at the same time. If the path is cleared, and I don’t have to wade snow, I’ll be off to the mall in this outfit. Now, I may just throw on my Max Mara tweed coat with this get up and head to the mall. 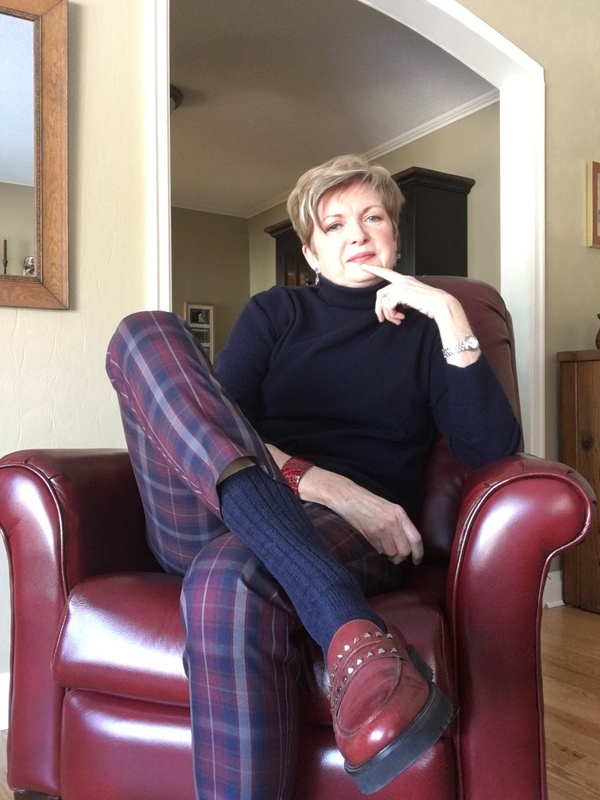 I’m thinking that a lovely new pair of plaid socks would look great with my black Stuart Weitzman loafers, black leggings (turned up to make them ankle length), and an untucked white shirt. I may not be original enough, nor quirky enough when it comes to outfits, to qualify as a fashion icon. I’m too conservative for that. But I am usually game to try new things. Well, mostly game. Most of the time. Usually. Ha. Hedging my bets there, aren’t I? How about you folks? Any midwinter wardrobe blues out your way? How are you coping? Magic socks for whatever ailed us… wouldn't that be wonderful? I didn't wear cropped trousers for ages because I didn't like the idea of a bare ankle and bare feet in shoes, in winter. With you on jumpsuits, had one when I was 25, haven't found one since. Ah… jumpsuits. Too short in the leg and too long in the body for me. Still I like the look on others. I wore them back in the seventies, and still remember the long washroom lines at a club and then the time consuming complicated process once I was in the cubicle. Not least of which was keeping the top half of the suit of the floor. Ha. I do like a smart sock with a brogue. But sadly I have lost my lovely striped pair so may need to buy a new pair. Like you, can't find a jumpsuit that fits and am not bothered enough to seek further. Do, however, go and see The Favourite. I went yesterday and it is a wonder. Not for the faint-hearted but visually stunning and with some wonderful performances from the whole cast. Reminded me strongly of The Draftsman's Contract. I must remedy that if I can find someone who wants to see the film. Hubby would NOT be a good candidate. He hates the loudness of movie theatres these days and refuses to go. Hi Susan, may I suggest checking out the Facebook group Style your way to success over 50. I have joined the spin off paying group called Style Club for women and and I am enjoying the community. Glad that you're enjoying the group, Tamra. I guess you get to post shots of yourself and ask for style advice? I tried looking it up on Facebook but could not see what they are about without joining. This gave me a good chuckle, especially the comment about Ronald McDonald! And I love that you were perfectly coordinated to your leather chair. Socks! I can’t count the number of times I have given entertaining socks to both my sons, and while I may buy the occasional pair that are interesting for me, I rarely wear them. And even if I do, my jeans cover them up. But this look that you are wearing is just adorable on you. Big thumbs up, and entertaining too. And the max Mara coat on you is lovely. Thanks, DA. I hear you. Last year my new spring coat solved a lot f issues for me once the snow had gone and before it was warm enough to rally wear spring things. And bright scarves are great too, aren't they? Maybe I'll haul out my red/orange hat and buy a pair of socks to match. Not having lovely ankles and being short requires that I not wear cropped pants, so it bothers me not that I wear socks. Actually, I need them. One of the joys of aging for me has been the inability to find comfortable shoes, particularly after having ankle tendon repair surgery. One way or another I have to 'doctor' all my shoes to wear them for any length of time–meaning I must put in extra padding here or a bit of moleskin there, so socks/tights are simply required (except, you will be happy to note, with sandals). My friend Liz who is small in stature, says the same. She needs the longer pant to lengthen the look of her legs. Isn't it good that so many of the "fashionable shoes" these days are sneakers and the like? So much easier on the feet. Love it! Breaking our own rules is a lesson in humility for sure. I’ve been thinking about Dansko clogs again – I love the comfort and ease they offer my poor, flat feet. Fashion, be damned! Socks sound like the perfect “adventurous accompaniment!” Thank you! I wish I could wear clogs. But I couldn't keep them on my long narrow feet back in the seventies, and that hasn't changed. 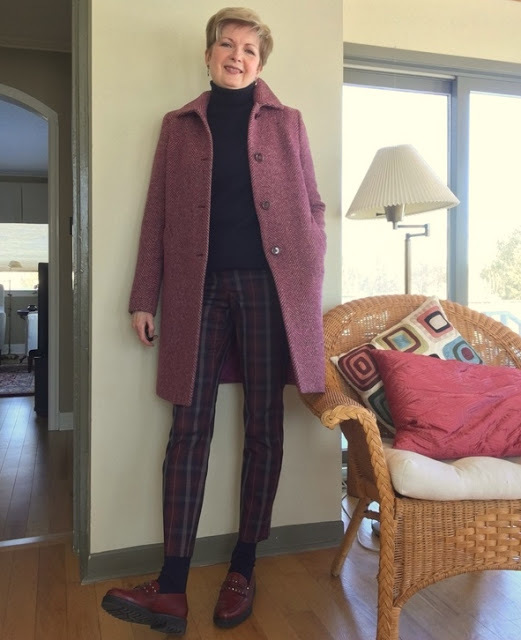 Oh… burgundy ankle boots and socks with navy trousers sounds lovely to me. I'm soooo with you on jumpsuits, rompers and culottes and promise to never change my mind. Love the look you've assembled and your description of the rationale. Thanks. Thanks, Lynda. Rompers… I forgot all about rompers. I've always hated those… except on little kids. Susan, thank you for this post. I own the very same Paul Green shoes and have felt that I’m just not getting my money’s worth, because I couldnt figure out how to wear them in the cold. This will help! I love the look of boiler suits, jumpsuits, whatever they're called. And I love how they look on me. And that they're sort of "Yeah, that's right — a onesie! Wanta make somethin' of it?!" My only real objection to them is what's involved getting in and out of them to go to the potty in public bathrooms. Yeah, there's all that unbuttoning and rebuttoning. But there's also the holding onto all that material in the interim. Oh, well. They're much more comfortable than stilettos. As long as the "onesie" doesn't have feet in it, I'm good. Ha. As far as using the facilities in a jumpsuit… I keep thinking being in one of those washrooms we encountered occasionally in France, with the handholds, and no seat. My girlfriends and I laughed about trying to use one of those… and the choices that had to be made. I won't go on. Ha. I'm with you on the jumpsuit/boiler suit thing ! I last wore one in the early '80s and found I didn't feel comfortable and the look didn't suit me either. As for the visible sock look, I just stick with thin black socks, not matter the colour or cut of my garment. I'm back again – I thought I had commented the first time. Ah, the brain. You rock-em-sock-em! Well done on this new frontier. Really, it's a cozy proposition. I never even knew that socks with pants was a thing. Just as well. Unless they are white athletic socks, which I wear sometimes because they are at hand (although I would say I chose them on purpose). I've tried socks and sandals and, meh, kinda defeats the purpose of an open toe. Then again, I've worn cycling booties over geta sandals in the winter to make bootals, I guess you'd call them. Once, only once. Enough. Thanks for the mention! Ha. Bootals… you might make them a thing. I've discovered sock knitting and have knitted myself, family, and friends all sorts of loud, colorful socks. Makes the dull days of February a little less dull. I've never knit socks before. My mum knit heavy woolen work socks regularly for my step-father to wear in his boots to the barn or out to the woods logging. I still have the wooden forms she used to dry them on.